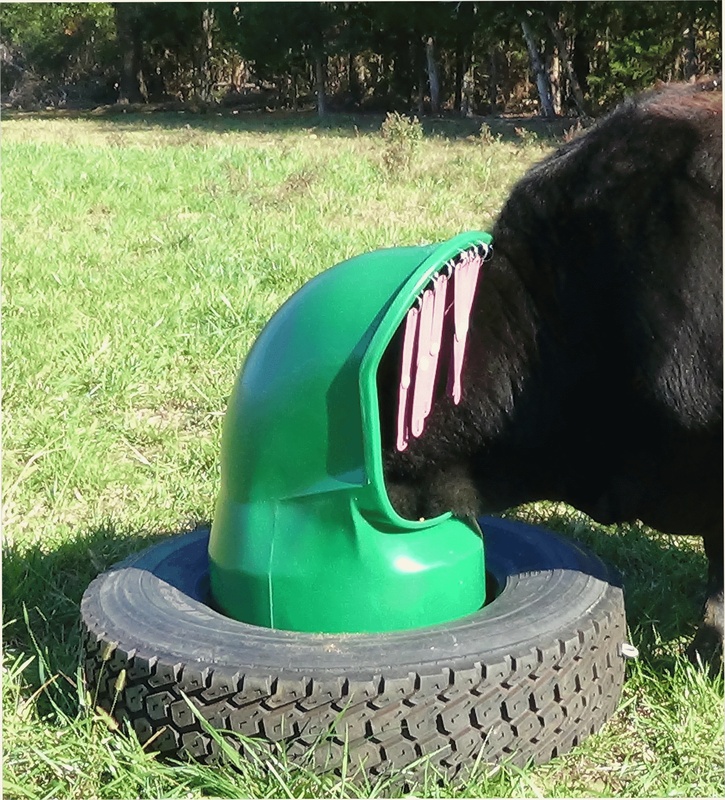 > Perfect for Range Cattle as it prevents having to catch and work cattle to provide horn fly control. 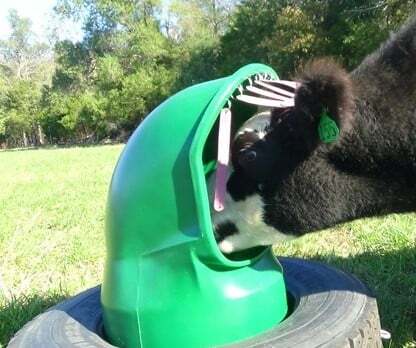 > Feeder can be used by all ages and sizes of cattle. From 3 week old calves to mature bulls. > Economical - Costs less than other forms of fly control that are more labor intensive. > Saves Time and Money - No messy re-treatment of insecticides lie oilers, wicks and dust bags. Step 1 - Using a 1/8” bit, drill 10 holes for kick out rings in the edge of the upper arch of the mineral feeder opening. Make a mark at the center edge of the top arch of the opening (12 O’clock). Starting 1 inch from the right of the center mark drill 5 holes 1-3/4 inches apart in the edge of the arch opening. Repeat 5 holes for the left hand side of the center mark. 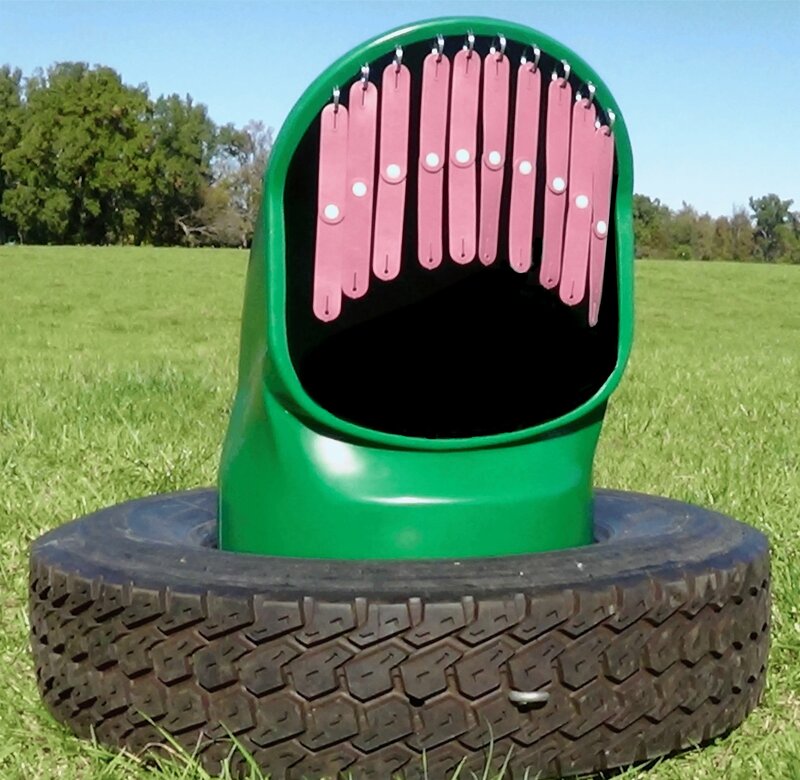 The holes need to be approximately 1/8 to 1/4 of an inch from the edge of the feeder opening. 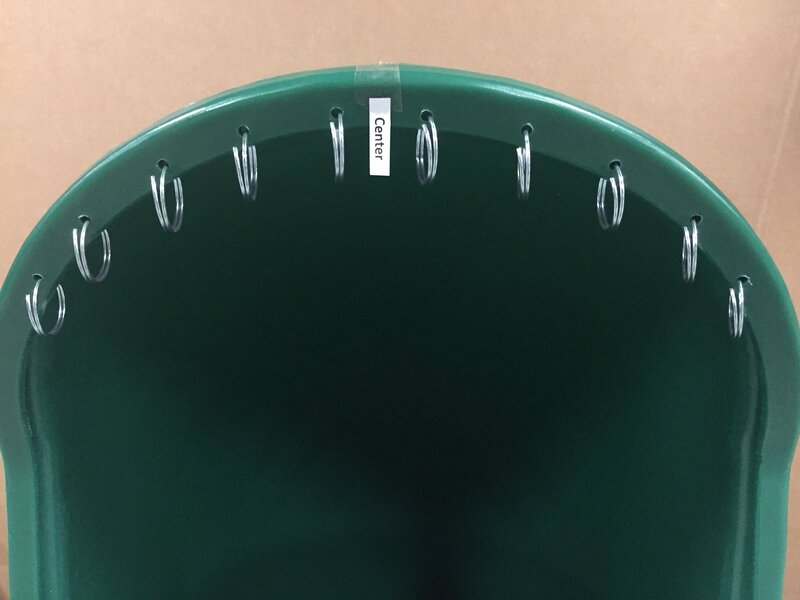 Step 2 - Attach the kick out rings to the feeder by threading them through the 10 holes previously drilled. Thread the kick out rings in the holes starting with the edge of the ring that sticks out. Step 3 - Thread the strip via hole onto the kick out rings that are attached to the feeder. This is done the same way that you threaded the kick out ring into the feeder. Starting with the section of the ring that sticks out. Feeder is now ready for use. It is a violation of Federal law to use this product in a manner inconsistent with its labeling. This labeling must be in the possession of the user at the time of pesticide application. 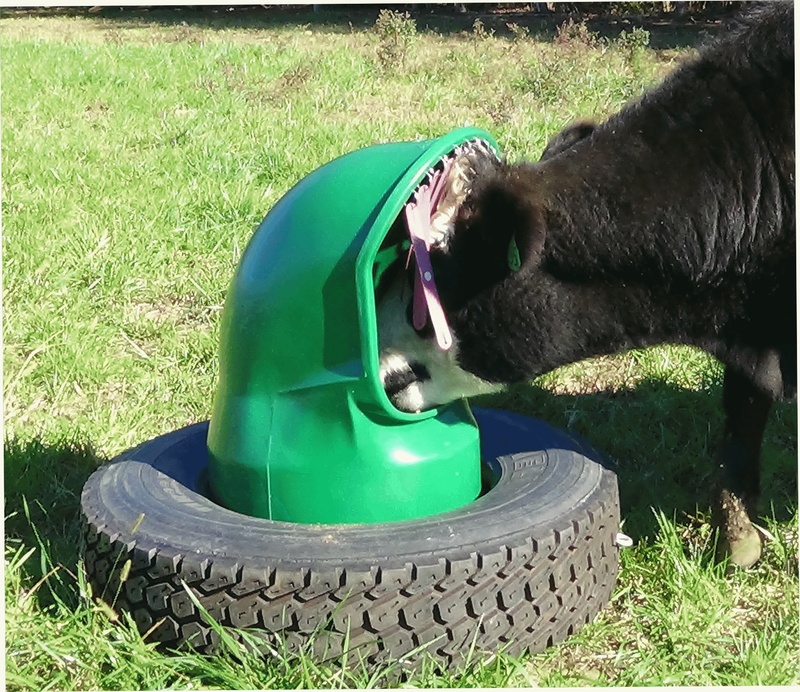 Place mineral feeders in use 14 days prior to placement of insecticide strips to get cattle used to the feeders and using them. Apply 10 strips per feeder (1 feeder per 10 – 30 head). Keep feeders well supplied with minerals and place close to water to encourage daily use. When strips become ineffective, remove or replace. Store in a cool place in original container, away from direct sunlight. Opened bags containing strips should be resealed for storage. No withdrawal time required before slaughter. Securely wrap used strips in a plastic bag or several layers of newspaper and discard in trash. Non-refillable container. Do not reuse bag. Discard bag in trash, or offer for recycling if available. This pesticide is extremely toxic to fish and aquatic invertebrates. Do not contaminate water by disposal of used strips. Use this product only as specified on this label. User should wash hands before eating, drinking, chewing gum, using tobacco, or using the toilet. User should remove clothing / PPE immediately if pesticide gets inside. Then wash thoroughly and put on clean clothing. User should remove PPE immediately after handling this product. Wash the outside of gloves before removing. As soon as possible, wash thoroughly and change into clean clothing. If swallowed • Call a poison control center or doctor immediately for treatment advice. • Have person sip a glass of water if able to swallow. • Do not induce vomiting unless told to by a poison control center or doctor. • Do not give anything by mouth to an unconscious person. If on skin or clothing • Take off contaminated clothing. • Rinse skin immediately with plenty of water for 15-20 minutes. • Call a poison control center or doctor for treatment advice. Harmful if absorbed through skin. Harmful if swallowed. Avoid contact with skin, eyes or clothing. Wash thoroughly with soap and water after handling and before eating, drinking, chewing gum, or using tobacco. Wear long-sleeved shirt and long pants, socks, shoes, and gloves. Remove and wash contaminated clothing before reuse. To the extent consistent with applicable law, AMERIAG MAKES NO WARRANTY OF MERCHANTABILITY, FITNESS FOR ANY PURPOSE, OR OTHERWISE, EXPRESSED OR IMPLIED concerning this product or its uses which extend beyond the use of the product under normal conditions in accord with the statements made on this label, and in any case, is limited to replacement of strips only.